The standard overhead conductor is used for a long-term thermal load of up to 80 °C. 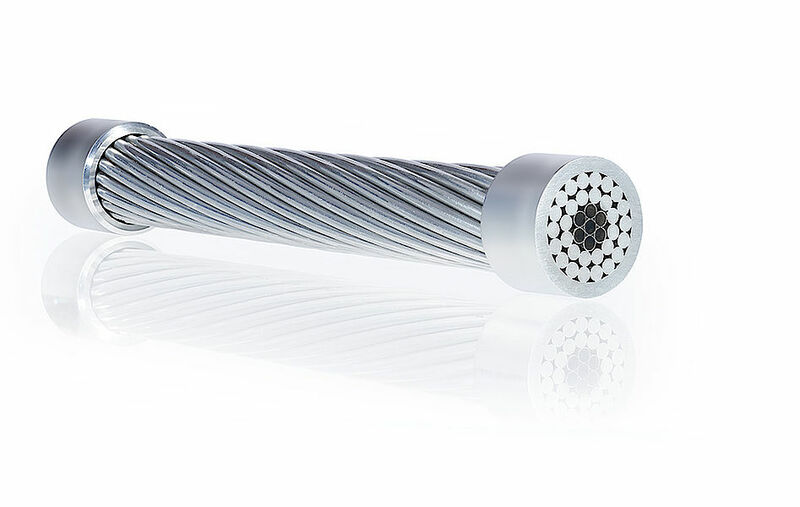 In order to increase transmission performance while keeping the same conductor design, aluminium conductors aluminium clad steel reinforced (ACSR/ACS) may be used in place of aluminium conductors steel reinforced (ACSR). In this case, the galvanised steel wires are replaced by aluminium clad steel wires of the same diameter. The use of aluminium clad steel wires enables a higher continuous current load and/or a reduction in transmission losses. The reduction in weight results in lower sag or lower tower loads. A significant advantage with regard to sustainability and the environment is the long service life, thanks to the high corrosion resistance of the Aluminium clad steel wires and the fact that it is not necessary to carry out lubrication as is the case with galvanised steel wires. In order to reduce visibility in particularly sensitive environmental areas or to optimise the continuous current load, the standard overhead line can be coated in a specific colour. Using a special surface treatment, a "noise-reduced conductor" version is also possible.